Designed to fit the popular Lutyens seats, these cushions are 6cm thick and filled with SuperiorFoamFill for added comfort. There is neat double edge piping to the top and bottom of the cushion, and Lutyens cushions come in a range of colours to bring a little colour to any garden or patio. Make your Lutyens chair a more luxurious prospect with the addition of this Lutyens armchair cushion. Expertly manufactured in high quality woven polyester, this lutyens armchair has been finished with double edge piping and features easy ties to firmly secure the cushion in place. 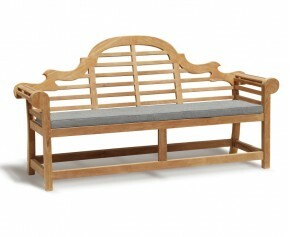 Adding a graceful touch of colour and comfort to your garden bench, this Lutyens bench cushion will be the envy of all your friends.Perfectly suited to our Lutyens Teak Bench 1.35m, this small Lutyens bench cushion has been neatly styled with top and bottom double piping and features a zip fastening mechanism to easily remove and clean the cushion cover. 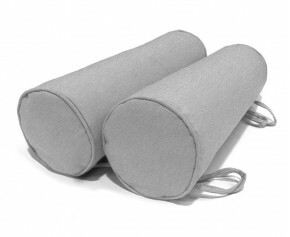 These outdoor bolster cushions are abundantly filled with a SuperiorFoamFill® inner for exquisite comfort and support. The cover is woven from durable polyester which is showerproof and can remain outside for most of the summer season.